The magic of childhood imagination is no match for New York real estate prices. 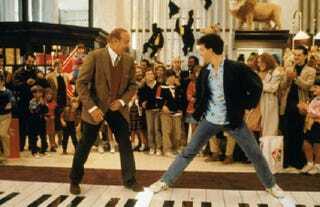 Toy store FAO Schwarz announced that it will close its famed Fifth Avenue location. The store, which has been at the famous midtown location for 30 years, said they could no longer afford the rent. It’s a sad loss for New York’s tourists who mobbed the location looking to reenact the famous scene from Big and bribe their children with overpriced stuffed animals. FAO Schwarz was purchased by Toys R Us in 2009. The company will attempt to retain the stores 200 employees, though they’ll be taking a bit of a demotion. According to CNN Money the company will try to transfer them to Toys R Us and Babies R Us locations throughout New York and New Jersey. Although maybe they’re so sick of hearing Heart and Soul that a Toys R Us in Jersey will be a welcome relief.